In Victorian London, the fates of physician Simon Bell and apothecary Gaelan Erceldoune entwine when Simon gives his wife an elixir created by Gaelan from an ancient manuscript. Meant to cure her cancer, it kills her. Suicidal, Simon swallows the remainder—only to find he cannot die. Hearing rumors of a Bedlam inmate with regenerative powers like his own, Simon is shocked to discover it’s Gaelan. The two men conceal their immortality, but the only hope of reversing their condition rests with Gaelan’s missing manuscript. 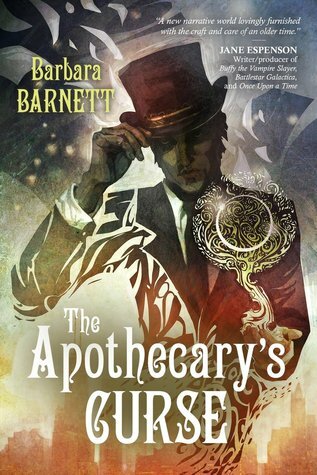 It took me a few chapters to get into The Apothecary's Curse, but once I did I really connected with the characters, especially Gaelan. The shifting time period worked well and was easy to follow. I also liked the way Barnett revealed information during the course of the story: enough to keep you interested but always leaving more to discover. The literary references are great fun, and I particularly admired the ending, which was most satisfying. Recommended for lovers of historical fantasy.